Late in 1914 volunteers were being sought to replace battle losses and new battalions were being formed. Labour was also becoming a significant issue on the battle front, with lines of trenches requiring construction and repair and communication links by road to the rear to be maintained. Indigenous labour was in short supply in France, given demands on their own armies. In December 1914 the War Office gave instruction that Pioneer Battalions were to be raised for each Division. 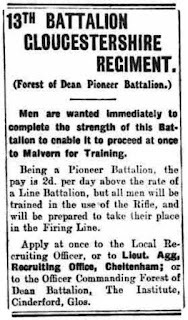 Meetings in connection with the formation of the Forest of Dean Pioneer Battalion of the Gloucestershire Regiment continued to be held through January 1915, but recruitment was slow. Up to Monday 18 January only 90 men had been secured towards the required 1,350. Recruitment campaigning spread beyond the Forest. Gloucestershire Echo (Tuesday, 19 January 1915) reported that Sergeant Foster Thomas was on a visit to the Rhondda Valley in South Wales to secure men for the Battalion. Adverts were also appearing in local press by February, 1915 (for example see right from Gloucestershire Echo, Wednesday 10 February 1915). The wider recruitment drive secured many more volunteers and by March 1915 they numbered over 800. 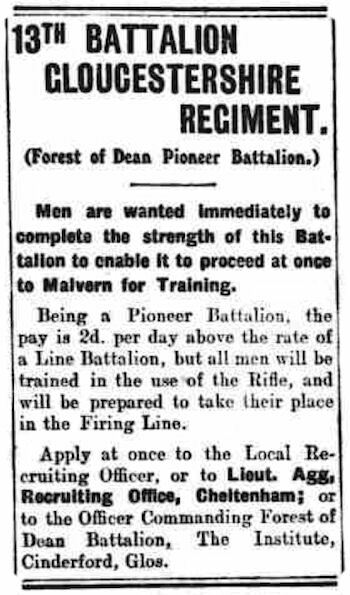 The men of the Pioneer Battalion had been under initial training at Cinderford, Gloucestershire, from where they entrained on Tuesday 3 March for transportation to Malvern for full training. The streets were full of people that fine morning to see them off. Mid-June the 13th Battalion moved from Malvern to new quarters in Yorkshire. The Gloucestershire Echo (Monday 21 June 1915) reported that “they were about 1,100 strong, and the Midland Railway Company provided special troop trains to take them to their new destination.” In August 1915 it was noted that they were stationed at Borden Moor Camp, Leyburn, Yorkshire. The 39th Division began to form around Winchester in early August 1915. The 13th Battalion Gloucestershire Regiment were the Divisional Pioneers. From Winchester the Division moved to Aldershot in October and later Witley, Surrey. Mobilisation orders were received in February 1916 and on 3 March the 13th Battalion entrained at Whitley, bound for Southampton. 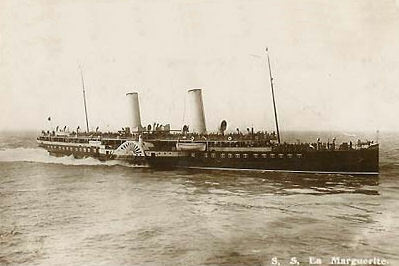 That evening they sailed on the paddle steamer La Marguerite, arriving at Le Havre around 6:30am the following morning. A day later they were on the move again and arrived at Thiennes in northern France on 6 March. Through March and April they moved around within the region, and work included making roads, constructing strong points and barbed wire entanglements, reclaiming old trenches, building dug-outs and making breast works. The men worked well and the Battalion received complimentary comment. By 14 April they billeted in Essars and engaged in draining, making and reclaiming trenches to the rear of the front line. During this period they experienced asphyxiating and weeping gas and sustained some casualties. They remained at Essars until Mid-June 1916. William Britton of Hotwells, Bristol, had attested late in 1915 under the Group (Derby) Scheme. He was mobilised on 21 January 1916 and two days later was posted to the 16th (Reserve) Battalion, Gloucestershire Regiment with whom he received basic training before being posted to the Front. On 12 April 1916 William was posted to the 13th (Service) Battalion (Forest of Dean) (Pioneers) Gloucestershire Regiment. By this time the Battalion was already in France; their War Diary records a draft of men arriving at Essars on 20 May and it appears highly likely that William was amongst these men where he joined D Company.